The 2012 Ben Pimlott Memorial lecture by Jean Seaton will take place at 6pm on Thursday 5th July in the Beveridge Hall of Senate House, Malet Street, London WC1E. In honour of the late Ben Pimlott, Twentieth Century British History, the Centre for Contemporary British History, and Oxford Journals have established this annual lecture series. 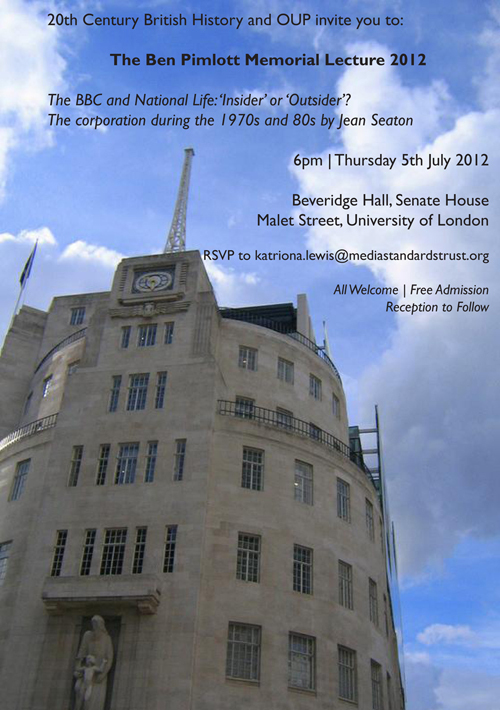 This year's lecture will be delivered by Jean Seaton on; The BBC and National Life: The 'Insider' or 'Outsider'? The corporation during the 1970s and 80s.